It is important to know their duties, so you know how effectively, this department uses your tax dollars. How do I have the rainwater drainage near the street or my house improved? If the water flow restriction causing the drainage problem is inside the right-of-way, then either the state, county or township will review the problem for possible repair. However, many drainage problems tend to be on private property. 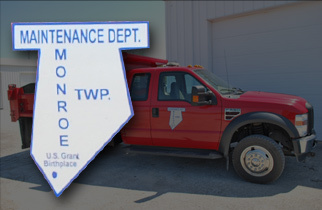 If you are not sure what is causing the problem, call the township at 734-6460 and someone will assist you. Who is responsible for taking care of the road in front of my house? In the township, there are several types of road systems. For instance, there are state, county, township and private roads located inside the township's boundaries. The repair and maintenance of these roads are the responsibility of entity that has the legal authority to spend funds per the Ohio Revised Code. What is the speed limit in front of my house? Residents who live in subdivisions are often surprised to learn that the police department cannot issue a speeding ticket to drivers who drive 55 mph on subdivision roads, if speed limit signs are not posted. Ohio law allows a speed of 55 mph on any public roadway that is not posted with a speed limit. Fortunately, Ohio law does allow residents of a public roadway to request, by petition, a reduction in speed. On state and county roads the residents must present the Board of Trustees with a petition, then the Board requests the proper entity to perform a speed study. But in subdivisions, the Board of Trustees has the authority to post speed limits of 25 mph. If you believe that your neighbors would support a 25 mph speed limit in your subdivision, the township requests a petition be signed by 50% or more of the residents who live on the affected road. A petition helps ensure that a majority of the residents support posting a speed limit. For more information contact the township at 734-6462. When is the snow and ice removed from my street?